It’s hard to respect a film that does not respect itself. And there’s no greater evidence of a casual approach to your own celluloid venture than a lack of attention to detail. 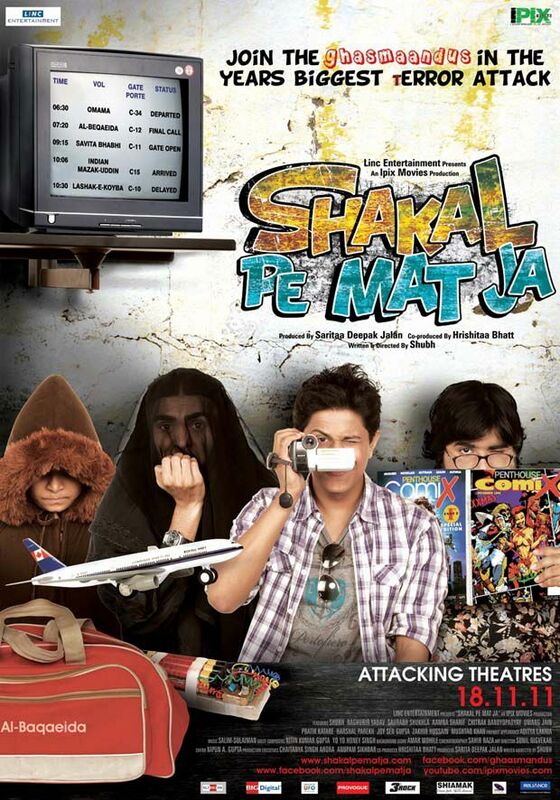 Shakal Pe Mat Ja – actress Hrishitaa Bhatt’s first shot at being a producer – is about a group of young documentary film makers who are mistaken for terrorists when they are found taking shots of aeroplanes near the boundary wall of Delhi’s international airport. Why should anyone believe these boys, especially when it turns out that their film is about how easy it is to make a bomb? Airport cop Om Prakash (Raghuvir Yadav) certainly does not, and so he calls in the Anti-Terrorism Squad (ATS). The story unfolds within the span of a single day. As it progresses, the time is repeatedly flashed on screen. But I was completely distracted from the moment the screen informed me that it was 11.15 am which was followed by ATS officer Chauhan’s wristwatch coming into clear view, showing 11o’clock. Since the film had gone awry by then, I entertained myself by looking out for Chauhan’s watch after that. Sure enough, at one point 3.21pm was flashed on screen to indicate the time of day in the story, soon after which I caught sight of Chauhan’s watch showing what looked like 4.30, and several scenes later, the time 4.03pm was flashed on screen. Aaaaargh!!!!! I know, I know, some of you will say that regular viewers don’t scrutinise films in this fashion. Well, shouldn’t the director care about that one meticulous, exacting viewer who does? Besides, every single such drop of inefficiency in Shakal Pe Mat Ja adds up to an ocean of tackiness. The sad part is that this concept had potential. It could have been an interesting satire on how suspicious we’ve all become in these terror-stricken times, plus a cutting comment on the ridiculous inefficiencies of India’s investigating agencies. Think about it … the terror group Al Baqaeda is led by a man called Omama who functions from a darkened room “somewhere in the Tora Bora”; one of the boys has saved his girlfriend’s name as “Danger” on his cellphone which sends the airport police into a tizzy when she calls him; at one point a cop comes face to face with escaped terror suspects who he had spent considerable time interrogating that very morning but he needs to stare at their photographs to make sure he’s got the right guys. This film could have been both funny and frightening. But it ends up being little more than a wannabe Tere Bin Laden, inane, inexorably stretched, shabby in appearance and filled with smelly farts. No seriously, there’s a guy who keeps farting! But flatulence alone does not a Delhi Belly make! Debutant director Shubh Mukherjee also stars in his film as the documentary maker at the centre of the fracas. Mukherjee is not a half-way bad actor himself. Cute looking too. His partners-in-crime played by Chitrak Bandyopadhyay, Pratik Katare and Harsh Parekh seem like they may be talented too. In a better film we might have known what they’re capable of. This is not that film. Perhaps the problem with Shakal… is encapsulated in its name. The phrase “shakal pe mat ja”, when translated, means don’t take anyone or anything at face value. There’s a lesson in there for so many Hindi film producers: good films are about good concepts well fleshed out by good scriptwriters and good directors. Keval concept pe mat ja … please!